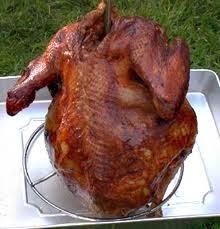 The Battle of the Turkeys...Roasted, Deep Fried or Both! Promise! A very moist turkey! I don't remember how or even when it started. As my sons grew older, I do remember a year when I noticed a bottle of hot sauce on the dinning room table. Since our table is where the family Thanksgiving is celebrated, it is often rather long with anywhere from 16 to 23 people seated around it. So, even as the head chef at this festivity, it wouldn't be unusual for me not to know everything that is going on at the other end. (Since this end has been deemed "the cousins" table, I have been assured that it is best I don't know.) Any way, About 13 years ago, I asked to have the big bowl of stuffing passed forward... and there it was, a bottle of Franks Hot Sauce hiding behind it. The explanation was simple. Since neither one of my sons were real turkey fans, they thought the addition of hot sauce would kick up what they considered a rather bland meat. Even their father, who sat at the other end of the table with turkey and gravy covering his plate, looked at the orange colored bottle with longing. So, it was then decided that we would try something different (along with the traditional of course) the following Thanksgiving. Creole "Butter" (it's non-fat) and spice! Enter, the purchase of a deep fryer. To give you an idea of how long ago this was, it came with a VHS tape of safety instructions. Basically, it was a video of how not to drop a turkey into a deep pot of boiling oil causing a splash into the open flame below. Duh. And since this is not a "how-to" blog on deep frying turkeys, I suggest a little research before investing. But I can tell you this...it is amazing! Like so many other things, the secret to a great taste is in the prepping. There are now so many seasonings on the market, the only difficult part is finding your favorite. 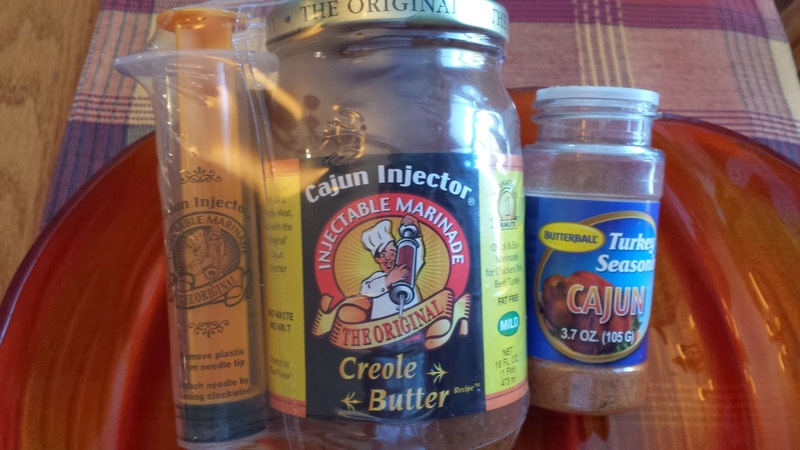 But we still use the"tried and true" product we started with "Creole Butter" injected into the turkey and Butterball Cajun Spices sprinkled on the skin. (Doused may actually be a better word here). Because turkey skin is so thick, when the bird is inserted into the preheated oil, the meat under it actually boils in its own juices. NOT at all greasy! It is simply the moistest turkey you will ever eat. And, basically healthy (unless, like my sons, you can't resist the crispy, spicy, brown skin to snack on)! The aroma alone has caused neighbors to hang over the fence with a longing in their eyes. And, in my family, it's a "man" thing. A common site in our backyard is a bunch of men standing around a deep fryer with a cigar in one hand, a beer in the other...all staring at the pot. So this year, thanks to Rachel Ray, I am making a fried turkey "gravy" that is guaranteed to knock your socks off! One of the ingredients is a 12 oz bottle of hot sauce. We'll see if it makes a repeat appearance next year. (if you're going this route, email me for recipe). 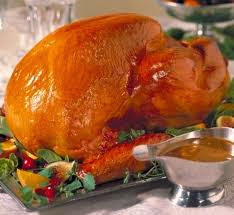 Now, all that being said, it is Thanksgiving Day, and I NEED my house to smell like it. I NEED a turkey roasting in the oven! I NEED homemade gravy to smother it! I NEED a late night turkey sandwich with mayo and cranberry sauce! (Okay, I'll stop now, I'm starting to drool.) NEEDless to say, my family has both. And since we always have a decent size crowed, leftover bags of turkey-to-go are an easily solved request. But let me add one more thing about the deep fried turkey. Since it is cooked outside, and since its aroma and flavor from all the Cajun additives sort of take it out of the "Thanksgiving" arena, it can and should be made year round. It is great on a summer Sunday afternoon with corn on the cob and a salad! At 3 minutes a pound to cook, it is ideal for all types of celebrations! My son Kyle, took our deep fryer to a tailgate party for the Philadelphia Flyers last season, and the spicy aroma wafting into the air on a very cold winter day attracted the police...who demanded a sample! 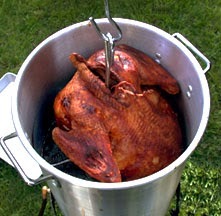 So, if you want to add a deep fried turkey to your menu this year, assign the task to the males in your group. It is a great way to keep them out of the kitchen while your trying to keep the "real" star of the day basted! Ahh! Roasted turkey and gravy! Still nothing like it! Cranberry Bog...A gorgeous Autumn site! Almost mid-November, and we are full on Thanksgiving! When I recently sold my larger home and was looking for a smaller one, the question would always arise "Can I host Thanksgiving here?" If the answer was no, we'd move on. It's my day! How can it not be? It's all about family, friends and food! My three favorite "F" words! It's also the official start of the frenzy holiday season. So to me, it's just the best day! From the first beat of the drum in the annual Thanksgiving Day parade, to the late night turkey sandwich, I savor every minute. I don't think that there is another holiday steeped in so much tradition and memories. Speaking of which, I can't enter the Thanksgiving arena without going back many, many years to when I was a young reporter sent by my editor into cranberry bogs nestled in the Pine Barrens of New Jersey. Cranberries grow well in sandy soil conditions making the bogs of this pine covered acreage perfect! 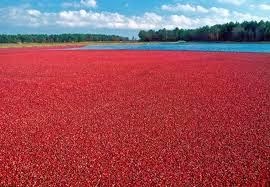 Quick lesson on harvesting cranberries is required so you can visualize this wondrous site. First, cranberries float (as so many of you crafters know), so a specialized tractor travels through the lush fields stripping the berries from their plants. Then, the fields are flooded with water, the berries rise to the top where they are corralled and loaded into crates. Cranberries are harvested in September and October. I remember my outing took place on a rather chilly, late October day. The bright blue autumn sky reflecting off of the deep crimson colored red ponds was visually stunning. It is a site I will always remember. Also, I learned that day that it is almost a certain that cranberries were at the very first Thanksgiving since northern native Indians tribes used them in the making of pemmican, a primitive jerky formed with venison, cranberries and nuts. A high protein snack that was used frequently in trades. Apparently, it stored well, lasting for months. Perfect for travel which worked well since we essentially started chasing them off their land right after the pumpkin pie was served. One more note on this favorite holiday staple. We might want to find a way to incorporate the consumption of cranberries into our diets year round. The Proanothcyanidins found in in this small but powerful fruit can prevent painful urinary tract infections by inhibiting E. coli bacteria from attaching to the urinary tract wall. In fact, The National Kidney Foundation recommends drinking at least one large glass of cranberry juice a day to help maintain urinary tract health. I will admit that I don't consume it on a regular basis. 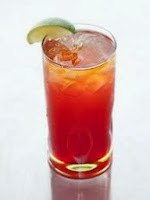 However, I am very fond of the "Malibu Bay Breeze" which is made with coconut rum, cranberry & pineapple juice. All healthy fruits. box and make it, not just at holiday time, but right through the winter as well. Since an egg allergy limits me to the use of egg substitutes, it's inclusion in this recipe is what attracted me at first. But it's moist texture and wonderful flavor, pushed it to the top of my "must bake" list. So take a look, and more to point, take a try. And, stay in touch with Kitchen Clatter because for the next few weeks, it's all Thanksgiving! In medium bowl stir together flour, baking powder, spice and salt. Set aside. In large bowl combine Kellogg'g Smart Start Antioxidant cereal and buttermilk. Let stand about 2 minutes or until cereal softens. Add pumpkin, egg substitute, brown sugar and oil. Beat well. Add flour mixture and cranberries, stirring until just combined. Portion evenly into twelve 2-1/2-inch muffin-pan cups coated with cooking spray or lined with foil bake cups. Bake at 375 degrees F about 15 minutes or until toothpick inserted near center comes out clean. Cool in muffin pan for 5 minutes. Remove from pan. Cool completely.